Do you like surprises? Of course you do, and “A Bird in the Hand…” is full of them! Not one, but three murders? Greg Evigan doing an outstanding job as the killer? A 90s episode that is actually very good? Yes! All of these things and more, in a greasy little noir-ish story full of twists and turns and double-crosses. One thing that’s not a surprise? The wonderful insights of returning guest, Dr. Christy Blanch. What I liked about Tyne Daily’s performance is that she Columboed Columbo. She played dumb and if not for Harold would have gotten away with murder. This was Columbo mixing up the formula in a way that worked. I also liked Columbo Cried Wolf more than you guys. That is what is interesting about many of the 90s shows. They really tried to mix up the formula, and had varying degrees of success. Here it worked. Dang, that is an excellent point about Dolores pulling a Columbo on … well, about everybody, really. I wish we’d thought of that! So glad that you liked this episode. I always have, and had some Columbo 90s shame about it. Christy is wonderful guest. Last thing – really love how Tyne Daly is even flirty with the cop taking her away at the end. If he was along while driving her to the station – I sometimes wonder if she actually got there, or if she took off with him at the end. Caught up with the ep tonight! A couple thoughts that didn’t quite get hit in the discussion. – What RJ was aiming at, calling it a “dirty crime story”, it has that James M. Cain/Jim Thompson gritty-noir feel to it. – I understand going for the restaurant scene over the wake scene. But I did love Tyne Daly’s initial heel-turn in the wake scene, where she puts Greg in his place and *explicitly tells him* he’s a powerless dork trying to throw his weight around. – Tyne Daly’s Southern accent. OK, I’m Southern so I’m tetchy about actors doing the accent. And Tyne’s was not nearly as cringe-y as I feared it would be. But – Tyne Daly, Southern belle? Tyne, who was so closely associated with the very Noo Yawk Det. Lacey at that time? And, given Harold’s whole stylistic conceit, isn’t it kinda surprising that *Evigan* didn’t essay a Texas accent? – Not so much Columbo this outing, true. But it was all redeemed when Falk delivered the coup de grace line, “No maam and I’m not gonna try, one in the hand is worth two in the bush. You’re under arrest.” Such a lovely delivery. Cracking pod. Welcome back! An interesting episode, certainly one of the 90’s better ones – the rest of the 90’s are all downhill from here, right…? After a couple of scenes of Tyne Daly’s character hiccuping and weaving around, I actually thought “For someone who drinks that much, she sure can’t hold her liquor very well.” So I was very pleased to see that much of it was just a put-on. It’s easy to get away with murder (literally!!! !1) if everyone thinks you’re just a hopeless drunk. We certainly are entering the final stretch here, and I’d like to remark that I think you might be underrating just how bad “Strange Bedfellows” is. It’s really really not good at all. And while it certainly has competition for worst episode (in my opinion, it barely edges out “Murder in Malibu”), it’s a strong contender. 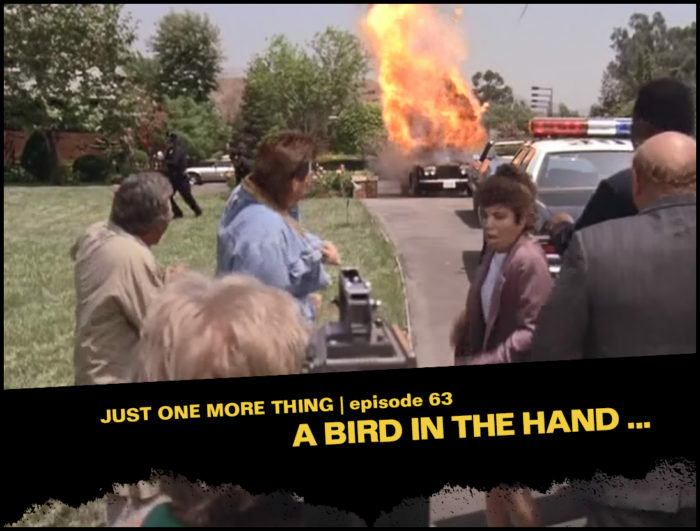 I thought the the normal Columbo parts (e.g., “Bag it. Bag everything.”) were okay. My biggest problem with “Strange Bedfellows” was threatening the killer with murder if he doesn’t confess or if he tries to get out of a conviction by bringing up the fact his confession was coerced. That made me think of Mike Logan’s last episode of the original Law & Order. I can see why Peter S. Fischer used a pseudonym. Although this is good for a late Columbo, I still find these lacklustre compared to the 70’s episodes. Good editing though with the car explosion. No-one seems to have mentioned that the RR Corniche was a $170k car at the time – they would not have wrecked one of these so must have used an old RR. However you can barely see the join where they swap the new and old cars at the point of explosion! The guy who maintains the spreadsheet is named Meagen. I have been called out most loudly and severely.